Myndology is a system for taking notes and recording information. It comes in two forms – Note Ring Bound or Sync Disc Bound. 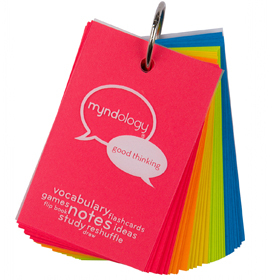 The Myndology note ring bound system is an all new way to loo at organization. From jotting down notes or ideas to a well organized flashcard set, the ring bound system lets you organize it your own way. Reorganizing is as simple as opening and closing the metal ring. The Myndology Sync disc bound system is an innovative binding technique for notebooks and journals. Free from the traditional “spiral” binding, the disc bound system provides you with the flexibility to arrange or rearrange the pages within. 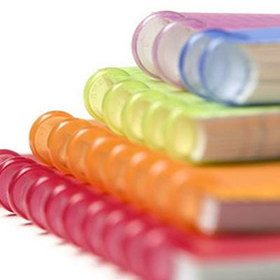 Think three ring binder in the convenience of a notebook. Simply pull your page out and place it back in. Additional page refills are available.